Electronic gears. Well, where to begin? 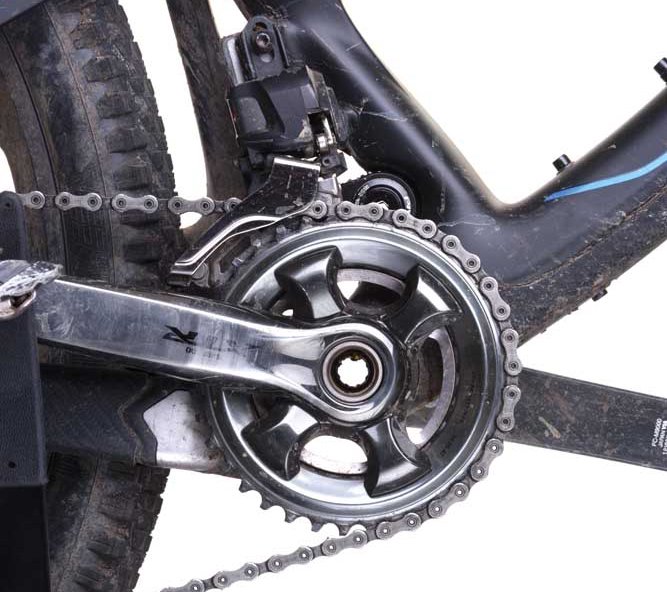 When I started riding mountain bikes, nine-speed drivetrains were exciting, and a Teflon-coated inner cable to try to mitigate the effects of sticky mud, a huge extravagance. Now we have 11-speed gearing, with mechs moved by motors and controlled by onboard computers. 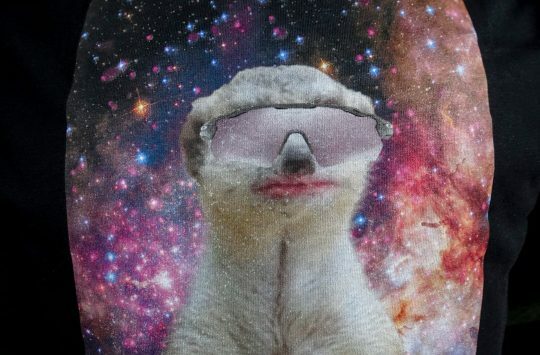 The future might not have given us hoverboards just yet, but this is a very good start. Front and rear Di2 mechs are fitted to the bike in exactly the same way as analogue mechs – with nice solid hex key bolts. The rear mech’s clutch is stronger than that on an analogue mech and though the front mech is a hulking great lump of plastic and metal, it doesn’t interfere with anything once fitted. The wires (yes, you still need these) are thinner than cables, and can be run internally where your frame allows. The battery is about the size of a small minipump, and can be mounted in a similar way to a bottlecage boss. We fitted our test groupset to Pivot’s Mach 429, which is designed to be Di2 compatible, and has space to house the battery as well as the wires inside the frame. 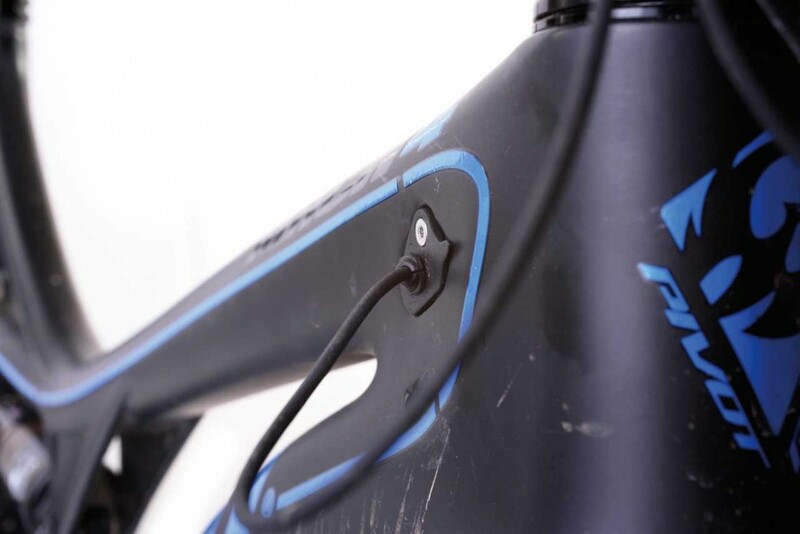 The shifters are smaller than regular trigger shifters, and the visual display – which you don’t have to run if you don’t want to – is unobtrusive, mounting neatly under the bar and staying dark until you make a shift. Once it’s set up (more about that later), operating the gears is straightforward, although not exactly the same as an analogue Shimano gear system, because the shifters are twin push-paddles. One click moves one gear, in either direction; press and hold on the rear shifting though and you’ll dump gears until you release the paddle, which takes a little bit of getting used to. It really is pretty foolproof; the only things you have to worry about while out on the trail are damaging the rear mech hanger, perhaps breaking one of the wires (though I haven’t managed that), and running out of juice. So what about that battery life? Simple: it’s good. No, more than that – it’s great! 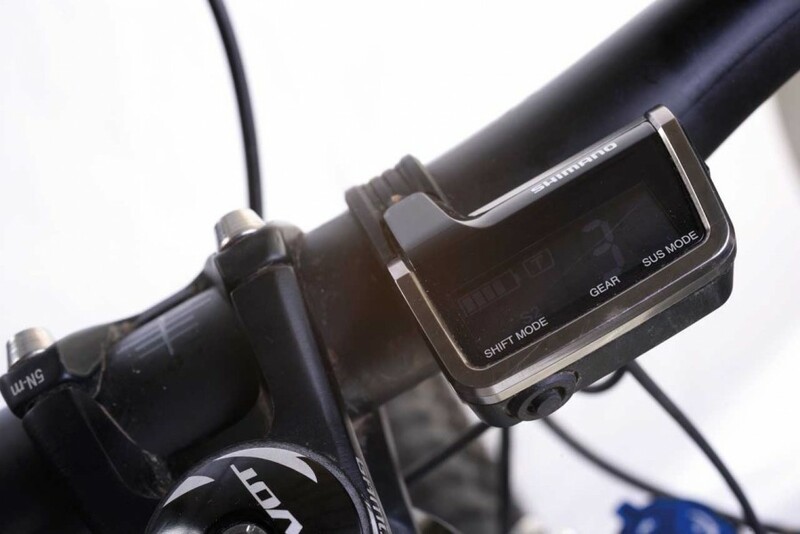 It will do ride after ride after ride on one charge, and even on a bike like the Pivot, where the battery is hidden inside the frame, topping up is simple – you just plug the charge lead into the covered socket on the side of the display (a novelty that never grows old). All the ports are well sealed, and my unfounded concerns about waterproofing have been allayed – the Pivot’s been jetwashed and ridden in horrid conditions repeatedly without any problems at all. Disappointingly, ‘dirty’ shifts still happen; under load the front mech doesn’t shift as cleanly as SRAM’s system, and dumping multiple gears at once still results in a racket if you’re not motoring while you do it. And while we’re on the subject of noise, let’s talk about the squelch… You’d think – and hope – that removing all the dirty, graunchy cables from the system would make Di2 almost silent. Not so. As well as the click at the shifter, and the chain noise as it moves across the rings/sprockets – both of which you get on an analogue system too – there’s also a distinct, robotic ‘squelch’ to be heard as the motor within each mech does its thing. It’s quiet, but it’s not sub-audible, and on a bike that’s as quiet-running as the Pivot, I find it really annoying. There are an almost limitless number of permutations in which you can run the system. One-by or two-by; with one or two shifters; left-front/right-rear or the other way around; sequentially on one shifter; mostly in the big ring; mostly in the small ring, and so on. I fiddled a bit, then plumped with sequential on one shifter for a faux-one-by-with-extra-gears – and there it has stayed, because it’s great. If you want to tweak the gearing, then you need to ‘talk’ to the onboard computer via a laptop. To do this you need to be Windows-equipped; Mac users need not apply, though Shimano promises Apple compatibility soon, and we’re hoping for a phone app for true flexibility. In practice though it’s perfectly possible to run Di2 without ever plugging it into anything other than the mains – get your friendly local bike shop to do the initial set-up to your tastes, and you need never touch it again. Fettling addicts can of course go the whole hog and run a different sort of gearing every ride if they want to – but you don’t have to, and that’s key. 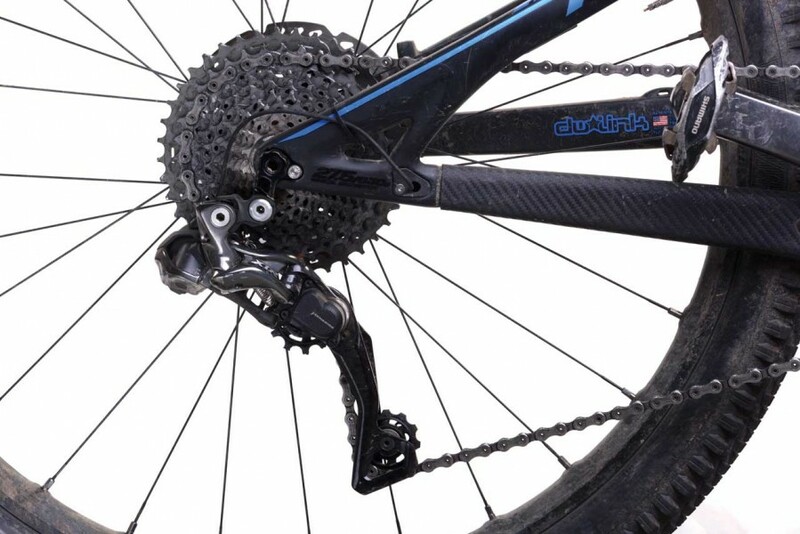 Right now, XTR Di2 is still hideously and prohibitively expensive. For sponsored racers and those with money to spare, then yes – it’s fast, neat and effective, and I think it’s worth it. For the vast majority of ‘normal’ riders, though, the benefits don’t come anywhere near outweighing the initial outlay and replacement costs.